This arrangement has a fresh look and is easy. You can make more than one arrangement and can vary the fabric on the jars and the color of the Gerber Daisies to add variety. This makes a very pretty little jar of flowers to greet someone with or a fun centerpiece. The Gerber Daisy is native to the tropical parts of South America, Africa, and Asia, and comes in different sizes and colors. 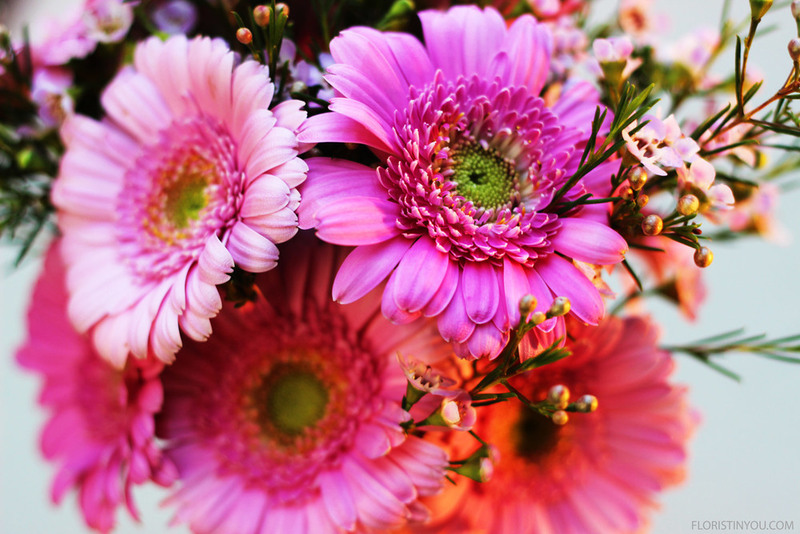 The head of the Gerber Daisy is made of hundreds of little flowers. Who knew! The Wax Flower, used as a filler, is native to southwest Western Australia. Wax flowers have five petals, ten stamens, and small round fruit. Wax flower makes a great filler flower. 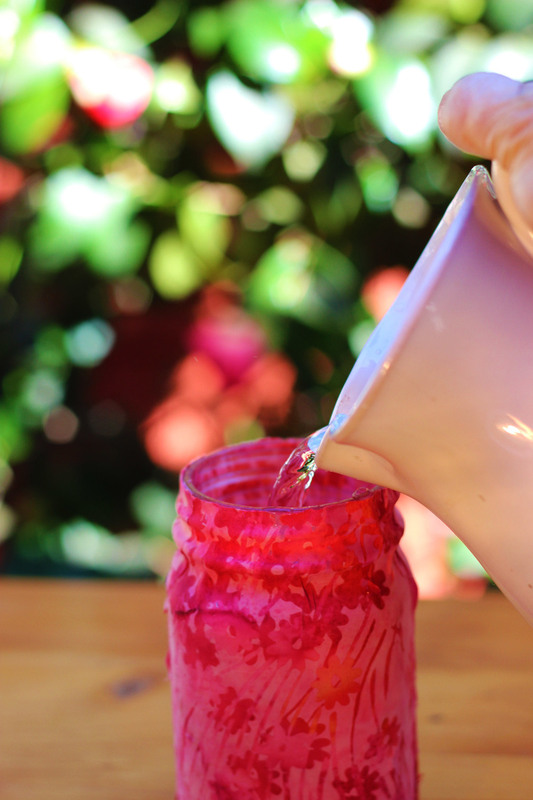 Pour water into your fabric covered Mason Jar, up to 1 inch below the rim. You sill use pink Wax Flower and pink Gerbers. 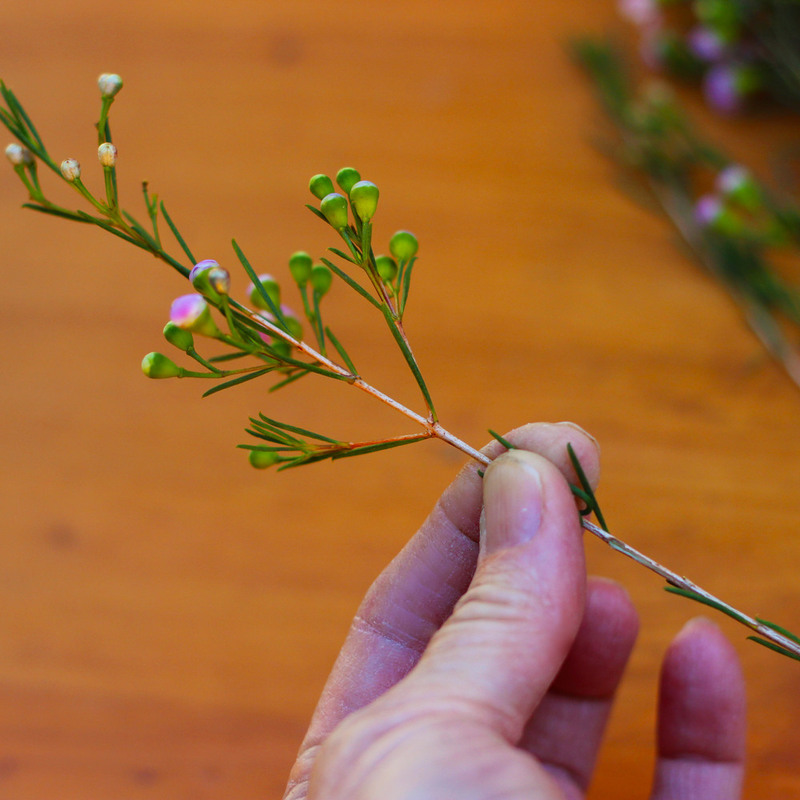 Separate Wax Flower stems. Cut stem with an angle. Should be from 8 to 11 inches tall. Use a stripper to take small leaves off bottom of Wax Flower stems. Use your fingers to pull off the rest below water level . 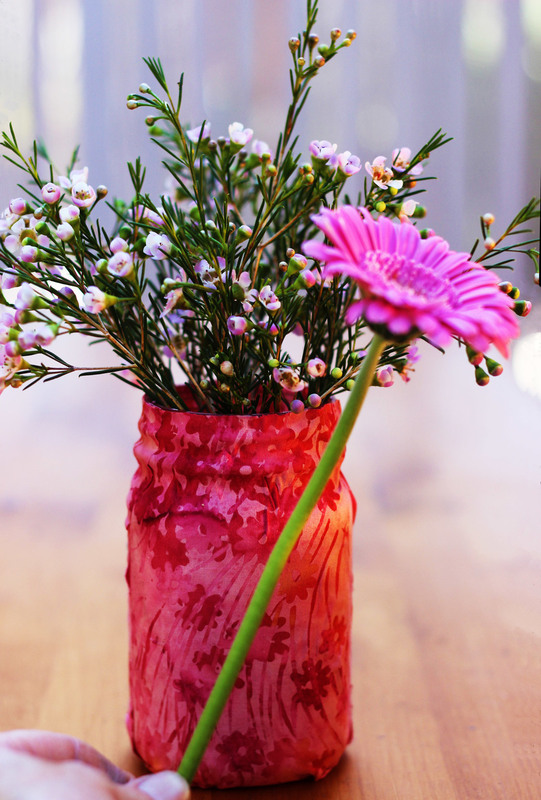 Place Wax Flower in the jar. Measure lower Gerbers. They should be cut about 7 inches. Measure middle Gerbers about 8 inches high. Put 3 in bottom front, 3 in bottom back, 2 middle front, 2 in middle back. Whew! Hello, Green Eyes! It's always hard to believe Gerbers are actually real flowers. Look at the tiny Wax Flowers. Aren't they amazing? There they are...hundreds of tiny flowers in the head of the flower. And here's for a little variety. Enjoy! Au Revoir.